St. Barths is a verdant, mountainous island, blessed with pristine white sand beaches and loads of French charm. Both the celebrities and fashion sets flock to the island. It's not unusual to see Calvin Klein, Vera Wang, Rachel Zoe, Michael Kors, Marc Jacobs in St. Barths, blending in with the locals. Big-name photographers like Patrick Demarchelier are drawn to the scenery and travel regularly to use the picturesque backdrop for photo shoots for everyone from Vogue to Victoria's Secret. 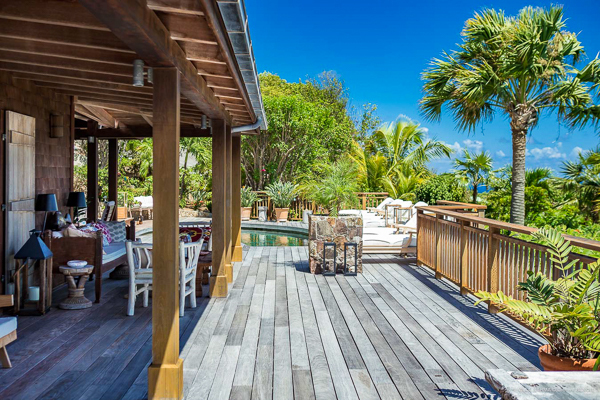 There are many great places to stay on the island, but insiders know that the best way to do St. Barths is like a local in one of WIMCO's 280 private villas. Each one has its own private pool, views of the ocean and its own concierge. Renting a villa, however, does not mean you'll be left to your own devices. From the moment guests arrive at the airport, they are whisked away to their villas. Upon arrival they are assigned their own personal WIMCO concierge who will be available to get them whatever they want - from grocery delivery to a private yacht charter - 24/7 for the length of their stay. Our concierge was a dashing Frenchman named Guillaume, and trust me; he took very good care of us. We called Villa WV COS home while on the island, and within minutes of dumping our bags on the floor (actually, Guillaume did all the heavy lifting, but he was well tipped!) we were relaxing poolside, taking in an incomparable view of Marigot Bay, celebrating Haute Living in St. Barths. With villas ranging in size from one to seven bedrooms, for parties of 2 to 14, there is a villa for every customer's needs. There are different style choices too, from sleek contemporary villas like WV COS, to Caribbean boho like WV NAM, to Balinesian cool like WV BAY. Villa life can be posh, organic and bohemian. When you are staying in a villa, guests get to see each other in a private setting at their leisure. Interactions just don't have to be so... planned. Your own residence also offers a feeling of independence. It’s easy to come and go when you want in your own car, and with little traffic and only 15 square miles of terrain, driving is worry-free. Fabulous beaches, shops, restaurants, boucheries, and pâtisseries, are never more than 10 minutes away. Freedom begins in the morning, take a quick jaunt to pick up croissants and fresh mangoes or have a private chef prepare gourmet meals at home, the choice is yours. The island and its residents exude a relaxed elegance that embodies the French “je ne sais quoi” mingled with St. Barths’ special brand of laid-back luxe. The dress code is an attractive mix of beach casual and Rivera prep. The hotspots in St. Barths tend to stay consistent. Saline beach is a favorite spot for a morning swim. Afterwards head to one of the island’s boucheries or pâtisseries or gourmet grab-and-go from Mayas to Go - a famous take-out restaurant in the order of Dean and Deluca. If you want something a bit more scene-y, go for an oceanfront lunch at La Plage at Tom Beach or Nikki Beach and dine with your feet in the sand and your eyes on the waves. Shopping hotspots are found in St. Jean and Gustavia, which is St. Barths' picturesque capital respledant with a marina, restaurants and of course, some of the best shopping in the Caribbean. Look for Calypso, Paupette and other well-curated stores featuring small French designers. St. Jean has both stores from names like Hermés and Vuitton, and independent boutiques like Human Steps, which carries Prada and YSL, as well as Cartier and a number of other luxury jewelry stores. Whatever your style, always leave a little room in your suitcase when packing for St. Barths because you will find lots of treasures. Sun down means dinner prepared by a chef in your villa or overlooking the city at a famous restaurant like Bonito. Rosé will be the drink of choice. The locals' favorite is Bertaud Belieu Rosé from the Domaine Bertaud Velieu in St. Tropez, St. Barths' equally intoxicating sister city.